My appologies for the lack of posting on the blog. I bought a home recently and have been spending most of my evenings remodeling. As most of my customers are home owners themselves, I'm sure you have some empathy for my predicament. 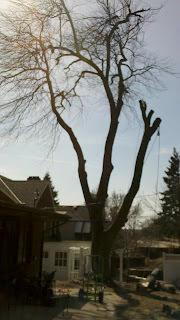 At any rate, here is a video of a silver poplar tree we were removing today. For fun, I put a cone in the yard and wanted the tip of the branch to hit the cone. I was 6 inches off. This person had asked for a bid on removal last year. She said she couldn't afford the price I gave to her. I drove past her house this week and saw this ugly picture. Not only is topping illegal, it is bad for your wallet too. Now, not only did she pay for someone to kill her tree by topping it, she now has to pay someone to remove the tree. She will spend more money now than she would have the first time. Do you trust your trees? 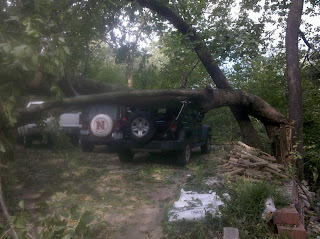 I went to a customers house today to find this 65 foot hackberry tree snapped at the trunks. 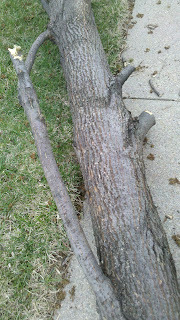 While we did have high winds, I do not like hackberry trees because they are prone to breaking off large limbs. This is a good example why you shouldn't let your tree rub the house. 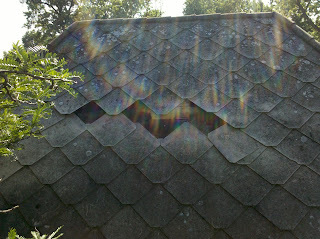 This locust rubbed the shingles off, rubbed the tar paper off, and left the roof exposed to leak water. A cheap trim job could have saved a lot of money. We removed this Pin Oak tree at 60th and Western last week. It was a tricky tree removal. The tree was surrounded by wooden planters and benches and the whole area was paved. Every piece had to be lowered to prevent any damage to the property. The tree had to be removed because of a bad lean. The tree was suffering root damage from the lack of available soil for root structure and damage from the excavation for construction. 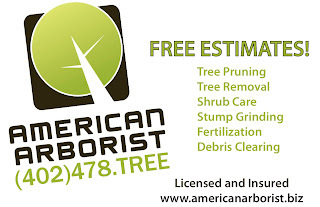 Call American Arborist today for your free estimate on trimming, removal, or stump grinding. This linden tree we trimmed in West Omaha had some interesting growth. It was in dire need of trimming and one branch actually grew back into itself. It can be seen in the photo. 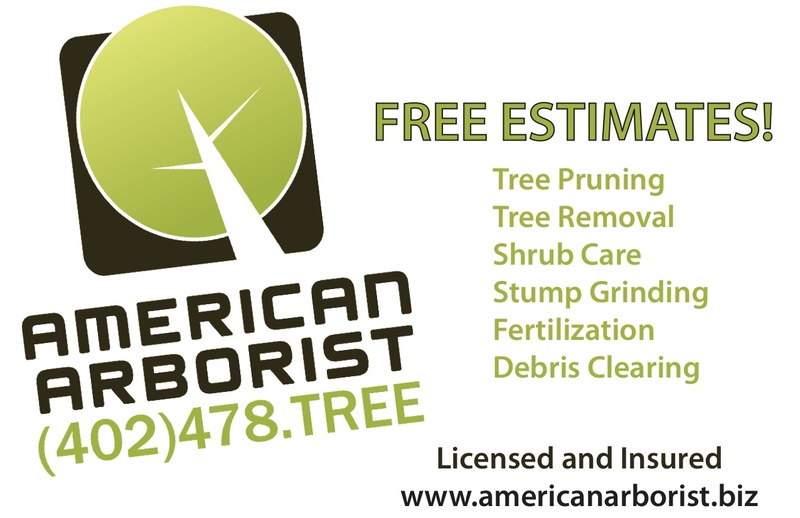 We've been busy at American Arborist. 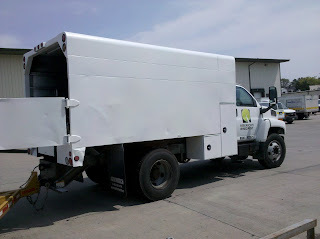 We recently made some equipment purchases to help facilitate the demand for our services. 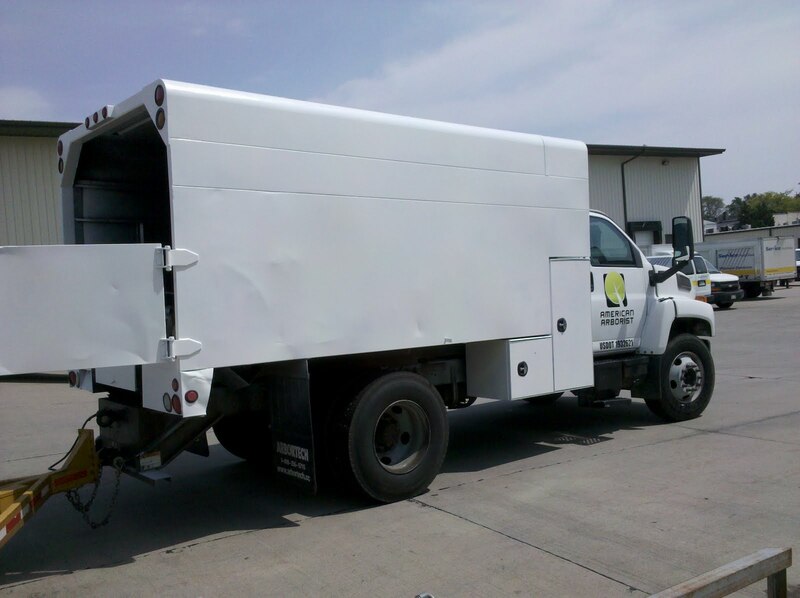 This is our new chipper truck that holds 25 yards of chips. The large load capacity means we can spend more time on your job and less time running loads to the dump. 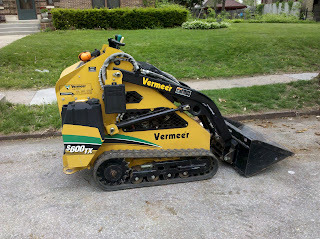 This is our new skid steer. Paired with our grapple, we are able to grab large logs and loads of branches and carry them to the truck and chipper. The machine only weighs 2800 pounds, so it does no damage to lawns. This minimal impact is important. 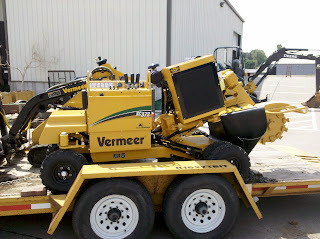 Here is our new stump grinder. The Vermeer SC352 has a 37 horse diesel motor and powers through any size stump. Call us today for free estimates. We continue to provide premier tree care in Omaha, Nebraska. 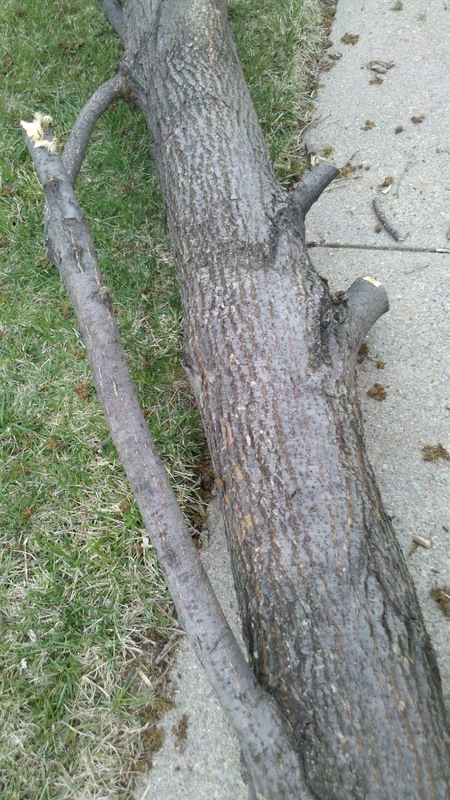 When pruning trees it is important to keep the weight of the branch from tearing the bark on tree. The red lines show you how to properly cut a branch. Magnolias are my favorite tree this time of year. They bloom before every other tree, so their color is that much more vibrant. Here is a great looking magnolia at Joslyn Castle. Bradford pear trees are just starting to bloom and will be followed by crab apple trees soon after. Give us a call if you want to find a colorful tree to add to your yard. 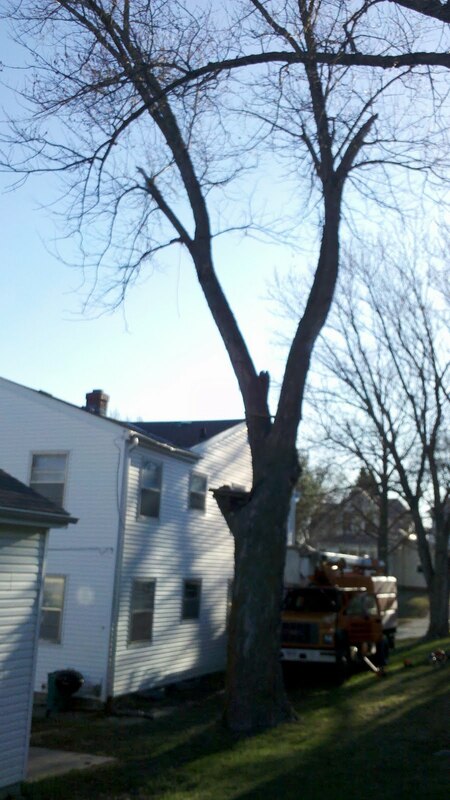 Another large silver maple removal in dundee. This tree was 82 feet tall, over two houses, and has a diameter of 42 inches at base. Note the lean of the tree. In 2010, 1/5th of Pakistan was under water. How did the spiders survive this flooding? They all retreated into the trees. With the overpopulation of spiders in the trees, the trees were entirely covered by webs! What an interesting phenomenon. 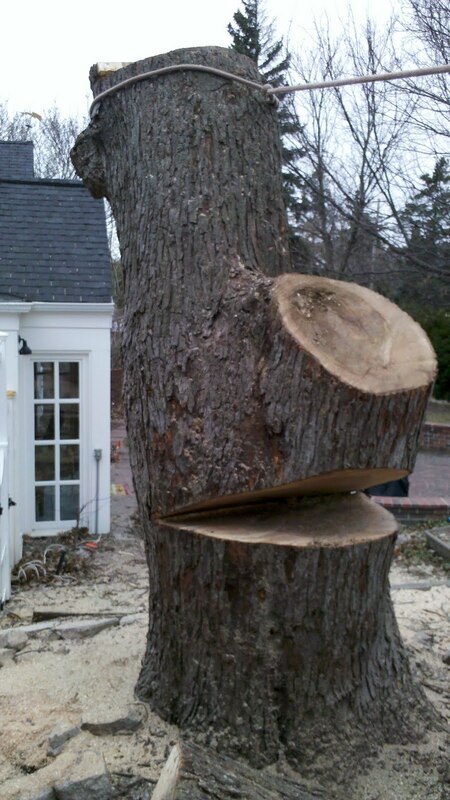 When hiring an arborist, give careful consideration to their qualifications. 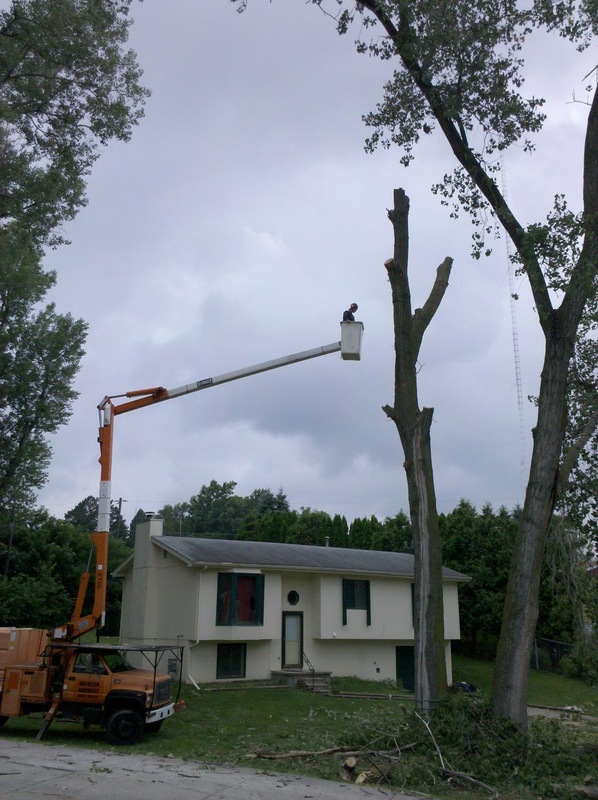 A qualified arborist will properly and carefully perform basic tree care activities, while hiring an unqualified arborist may actually result in tree damage. Unqualified persons also may not have proper insurance, leaving a liability burden to the customer that could run into the thousands of dollars. Be cautious of any arborist or tree care service that advises "topping" trees. 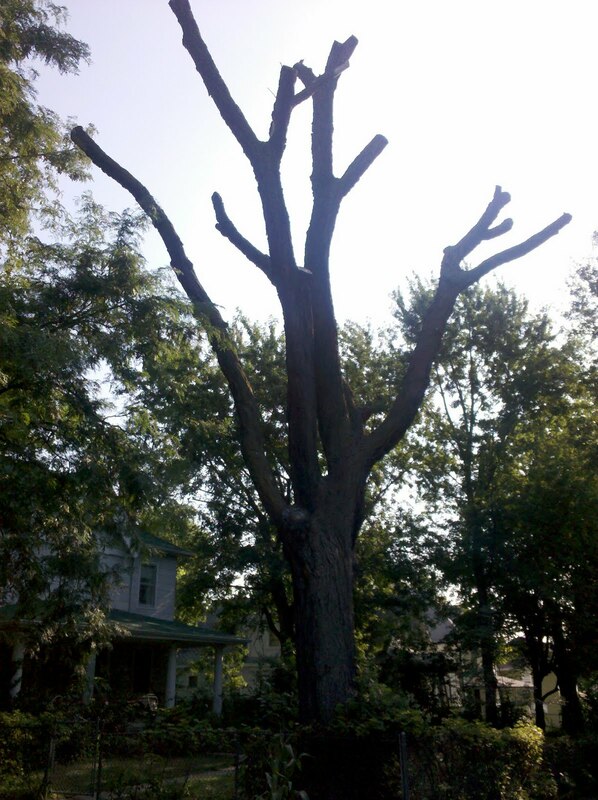 Topping is not an approved tree care practice and will result in serious tree damage or premature death of the tree. 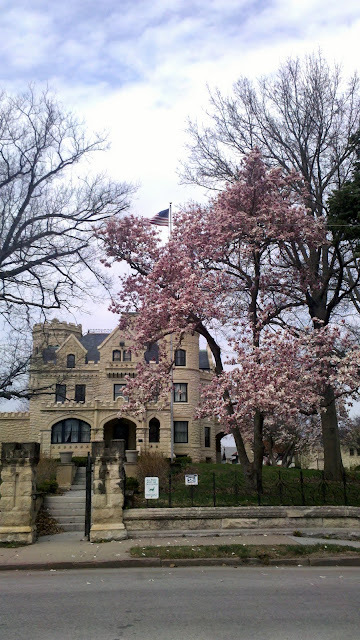 Ask arborists if they are certified by the Nebraska Arborists Association (NAA) or the International Society of Arboriculture (ISA). While arborists are not required to be certified, certification does indicate the arborist has a high degree of knowledge of tree care. Ask arborists for certificates of insurance, including proof of liability for personal and property damage and workman's compensation. 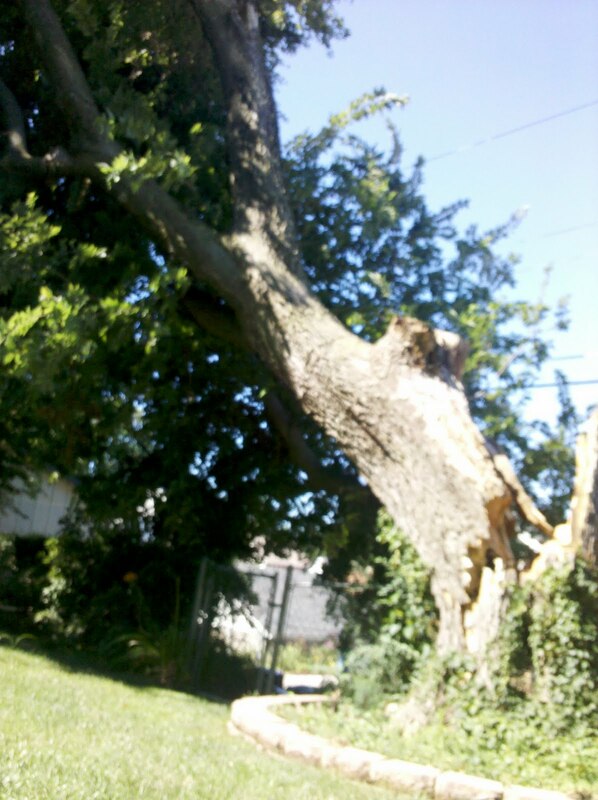 You may wish to contact the arborist's insurance company to be sure the policies are current. In some instances, you may be held financially liable if an uninsured worker is hurt on your property or if an uninsured worker damages a neighbor's property. Ask for local references and take time to examine some of the arborist's work. 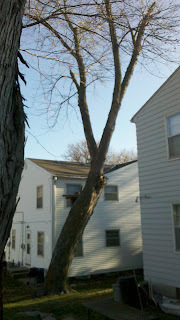 Be wary of arborists who come to your home and tell you a tree on your property will "die without immediate attention." Most reputable tree care companies do not need to solicit business. A conscientious arborist will not use climbing spikes unless they are removing a tree. Spikes create wounds in the tree that can lead to disease and decay. A good arborist will not be inexpensive, but the quality of their work will be worth the expense. *taken from UNL's guide for hiring an arborist. Bagworms defoliate trees, mostly evergreen trees. How do I spot Bagworms? Bagworms will be seen in larvae form, hanging from twigs in the tree. How do I treat my tree for Bagworms? On small trees, the best method for removal is a manual inspection and removal of each bagworm. On larger trees, however, this may be impractical. Bt, a chemical insecticide, should be applied to affected trees to prevent defoliation. Here is a short video from UNL about bagworms in Nebraska. Large silver maple tree removal in Dundee that is over 2 houses, a fence, and phone lines. Pine Wilt Removals in Action. These Scotch Pines were let go for too long. You can clearly see that they are all brown. 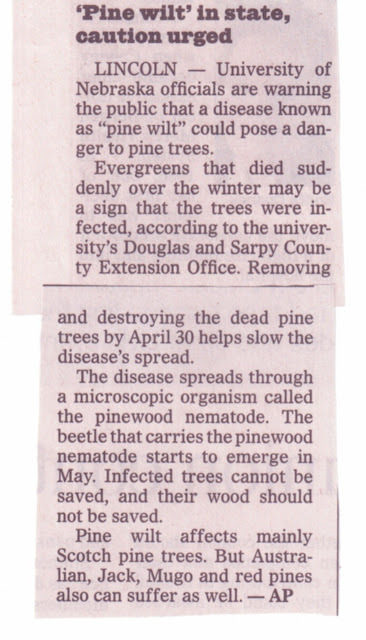 Don't wait this long to remove your diseased pines for 2 reasons. #1 It looks bad. #2 The beetles will start leaving this tree and moving on to a healthier tree. OPPD Named Tree Line USA Utility. 1. Sponsorships are available to nonprofit groups, organizations and schools with a formal leadership structure. 2. Application for sponsorship must be made by a person who is in a leadership position within the requesting group. 3. All prospective tree-planting projects must be in OPPD's service area. 4. Prospective tree-planting project sites must be on public property or property owned by nonprofit organizations. 5. Applicants must have permission to execute a project from the public agency or nonprofit organization responsible for the proposed planting site. 6. A project must be limited to one planting plan and one planting site. 7. Planning, preparation and execution of the project shall be the responsibility of the requesting group. 9. All trees and shrubs shall be purchased from a reputable nursery in Nebraska. 10. All deciduous trees should be no larger than 3 inches in diameter/caliper and conifers no larger than 6 feet in height. 11. All trees and shrubs shall be properly planted and mulched. 12. The project, or portion of the project funded by OPPD, must be completed as planned and verified by OPPD and invoice received by December 1 of the sponsorship application year. Failure to comply may result in forfeiture of sponsorship award. The OPPD Tree-Planting Program is limited; therefore, all requests for sponsorship may not be honored. Maximum funding for projects is $2,500. Actual award may be less than the amount requested. 1. Completeness of application and formal planting plan. Each tree and shrub, for which sponsorship is being requested, must be specifically identified on the planting plan. 2. Applicant’s base of support for the project (i.e., project funding contributed by requesting group, volunteer effort, commitment to future maintenance of project). The following are procedures for the application and awarding of OPPD tree-planting sponsorships. All applicants whose projects are not selected for 2011 Sponsorship funds will be notified by letter. 1. Submit application and formal planting plan (please see this example of a planting plan, indicating specie type, number and location) by March 25, 2011. Use only the OPPD tree-planting sponsorship 2011 application form. 2. Preliminary approval for sponsorship will be based on the application and planting plan. The applicant will be notified by April 8, 2011, if preliminary approval has been made. 1. Changes in nursery planting material or planting locations must be approved by OPPD. 2. NOTIFY OPPD AT LEAST THREE DAYS BEFORE THE ACTUAL PLANTING DATE. Planting site must be staked to identify tree locations and species. 3. Submit a final copy of nursery’s invoice to OPPD within two weeks of the completion date of the project. 4. Project site will be inspected by OPPD after completion. 5. OPPD will award sponsorship funds. Checks will be made payable to “requesting group” only. 6. Failure to comply with any of the above procedures may result in a forfeiture of sponsorship funds. If you are gearing up for spring tree planting, try something different. Head over to arborday's tree guide, to find a unique and appropriate tree for your yard. Stay tuned for our condensed guide and favorite trees for Omaha.